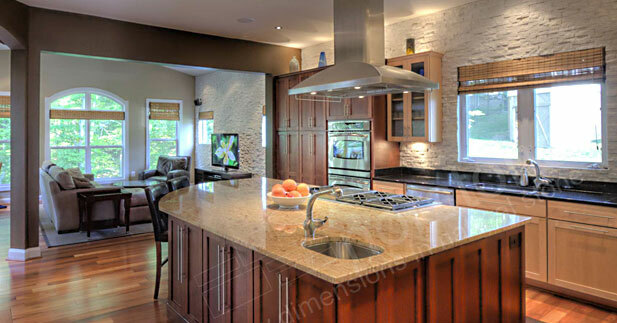 Stacked Stone Backsplashes Really Rock with Norstone. More thought goes into the countertop, cabinets, appliances and layout of a kitchen, but one detail that anyone building or remodeling a kitchen shouldn't overlook is the backsplash. 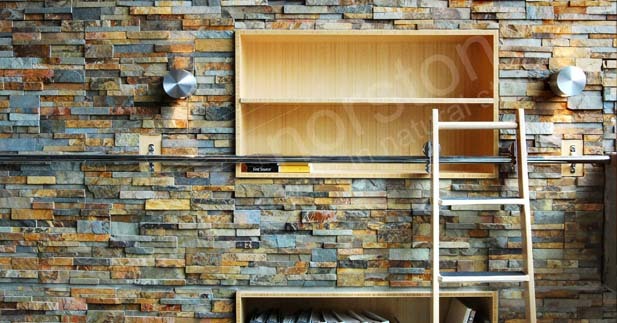 A stacked stone backsplash using Norstone Rock Panels is a unique take on the strip of space commonly found between the cabinets and countertop and you might be surprised that it'll end up being the first thing people see and talk about. 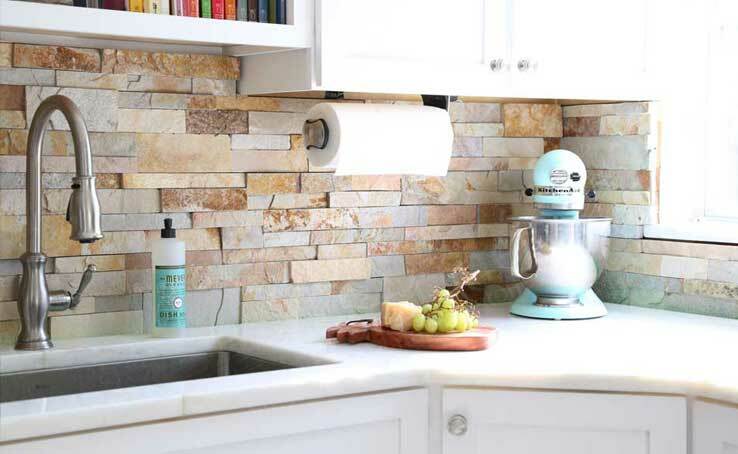 A stone backsplash is one of the most durable finishes for the application, and by sealing the tile with a natural stone sealer, most household cleanup chores will be similar in involvement to other surfaces like ceramic and glass tile. 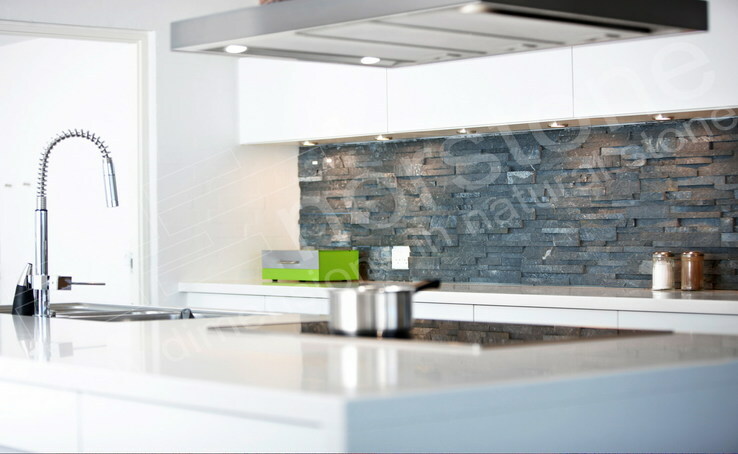 So whether your kitchen is used hard every day, or barely used at all, Norstone Rock Panels make a great backsplash tile option. 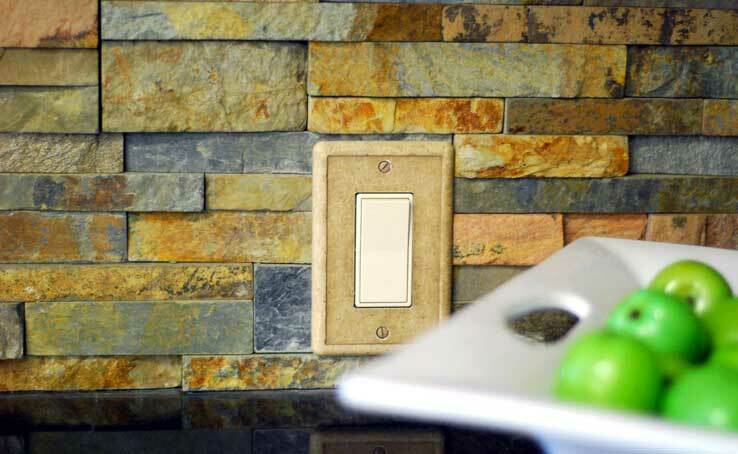 Subtle details, such as under cabinet lighting or switch plates made of similar materials will allow your natural stone backsplash to pop off the wall. 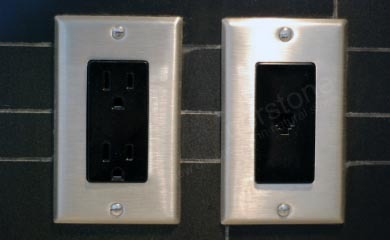 Dimmable incandescent lighting can be used to wash light over the tile backsplash, bringing out its warmer tones, and the panels themselves can be notched and your outlets and electrical boxes extended out to allow for your outlets and switches to be mounted at the same elevation as the stone. 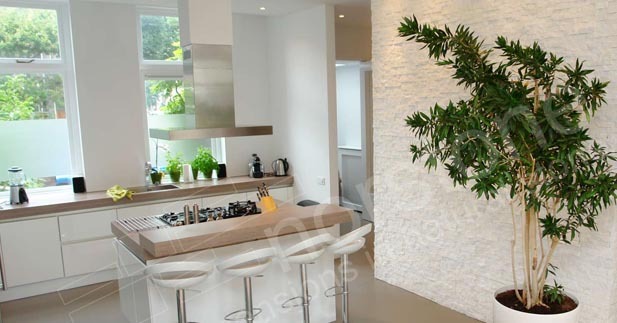 A stacked stone backsplash is a great introduction into working with natural stone rock panels and getting a feel for how versatile of a product it can be, springboarding the product into lots of other uses. 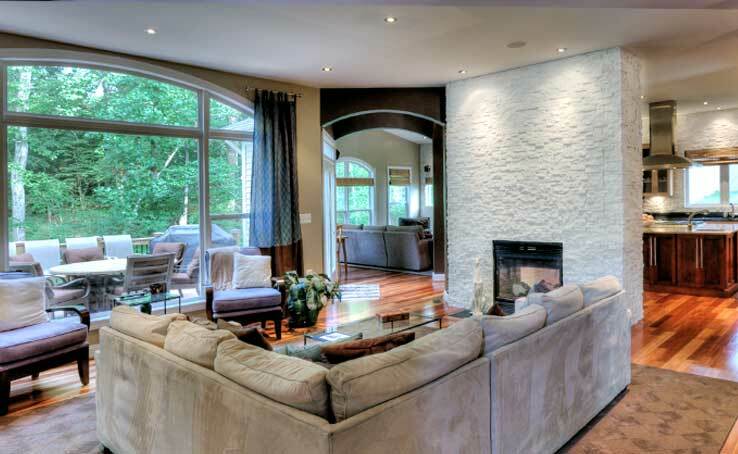 Quickly, you'll be able to see how a half wall in the breakfast nook, fireplace in the living room, or media wall in the den could use a makeover and how stacked stone might be a good fit. Sealing the tiles in your kitchen or bathroom stone backsplash is highly advised, allowing for much easier routine maintenance and cleaning of the application. From an installation standpoint, the backsplash is typically installed after the countertop, so care should be taken to cover the countertop during installation of the backsplash panels. While the backsplash panels can be installed all the way down to the countertop, you should guard against harsh, specifically acidic, cleaning agents coming into contact with the stone. A stacked stone tile backsplash is a design choice that will stand out in the endless run of glass and small format porcelain and ceramic tile that dominate current backsplash trends. 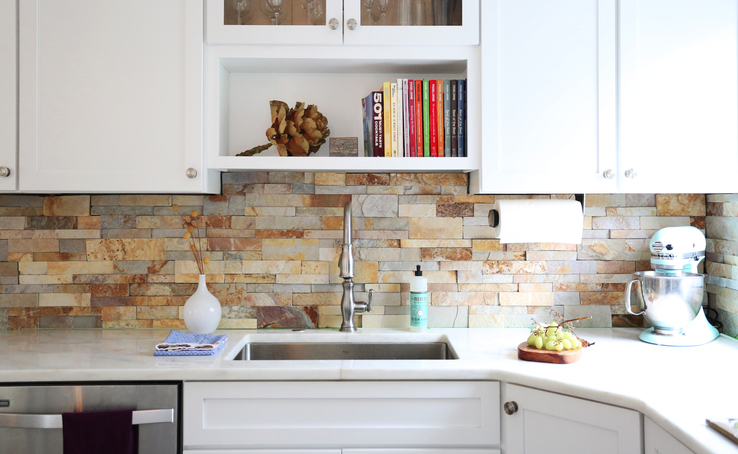 A stone veneer backsplash tells your friends and family you value traditional, natural materials but are bold enough to use it in a space often overlooked and devoid of design. A stacked stone kitchen backsplash might only be a small part of a bigger kitchen remodel, but just like door pulls and outlet covers, its something everyone will see and thus can create value to potential buyers. 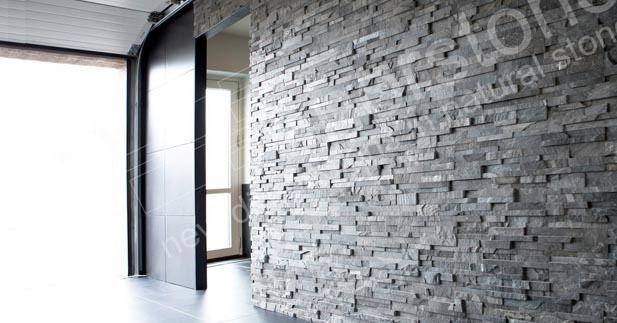 Whether you use a stacked stone backsplash tile like our Basalt Interlocking product, or our Rock Panel product to create a rock backsplash look, both are sure to add lots of value to your project. Although small, there's normally a lot going on in a backsplash. 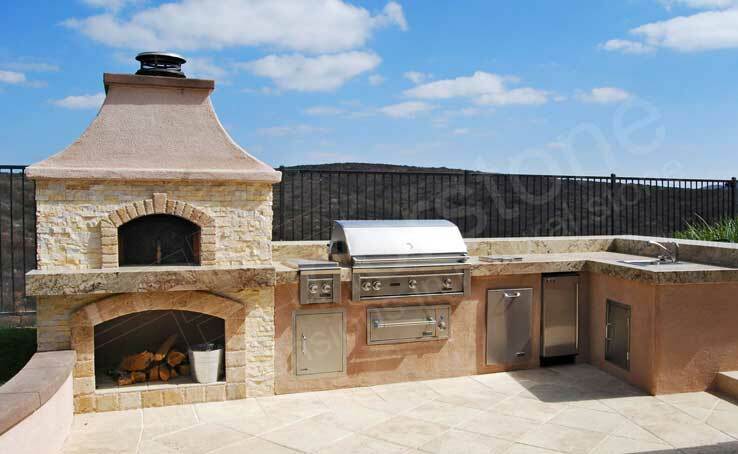 Check out the links to the right and Contact a friendly Norstone representative who can answer your questions, help you Learn how to install a stacked stone backsplash, or simply put you on the right path to your next one-of-a-kind backsplash.